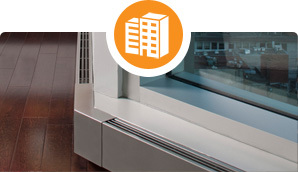 We provide comfort and functional heating solutions in residential, commercial, and industrial applications. With an eye to the future, our technologies are a key component of smart buildings and the electrical grid. Regardless of the power source, our products are efficient, safe, and adaptable. 100% efficient; zonal control minimizes consumption and cost. Less of a fire hazard than other heating technologies and no carbon monoxide risk. Can be incorporated into an entire home or single room. Perfect for cold rooms, additions, long runs, operator comfort, entryways, garages and taxi stands to name a few. Communicates and responds to the grid based on usage signals to save consumers money and match grid demands for supply. Public facilities where Electric Resistance Heating is used to control the temperature at entryways, around windows and in common spaces. Hotels, apartment buildings, stadiums, schools, convention centers and conference centers. 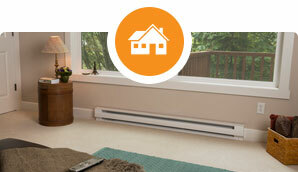 Single and multi-family dwellings where Electric Resistance Heating is used to heat rooms for human comfort. 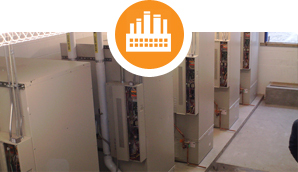 Cold rooms, additions, whole house applications and zonal control for energy savings. Grid interactive solutions for Smart Grid applications.